Welcome To The Avoiding April Showers Giveaway Hop! Welcome to the Avoiding April Showers Giveaway Event. This event is hosted by Put A Little Umbrella In Your Drink, My Mommy's World, Taking Time For Mommy and And The Little Ones Too. This event features giveaways with a value of $25 or more at each of the participating blogs! Be sure to visit each blog from the linky below and enter for your chance to win! This event will close on April 30th at 11:59 pm EST. Good Luck! MY GIVEAWAY IS OPEN WORLD WIDE! I'm giving away a pair of Kushyfood Flats To Go (Black Open Toe) in Size 7/8, a FRAAS Animal Print Scarf in Pink Leopard and a pair of Hush Puppies Purple "Willow" Flip Flops in 7/8. This prize pack is worth over $90! Just fill out the Rafflecopter form below to enter to win! Don't forget to check out these other great giveaways from our Avoiding April Showers participants! 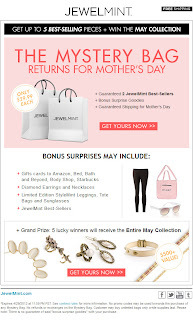 World, Taking Time For Mommy, and And The Little Ones Too along with the other "Avoiding April Showers Event" bloggers are not responsible for sponsors that do not fulfill their prizes. However, we are responsible for contacting our sponsors regarding the winner's prize at the close of the giveaway. We expect that our sponsors will fulfill their prize agreement and ship them to the winners in a timely manner. It's baaaaaack! 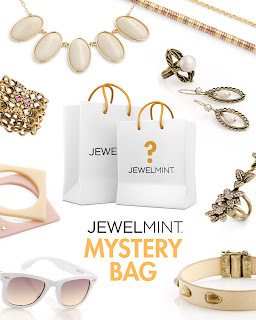 It's Mystery Bag time again at JewelMint! Log-in or sign up today to get your hands on one! Expires 4/29/2012 at 11:59 PM PST. See contest rules for more information. No promo codes may be used towards the purchase of any Mystery Bag. No refunds or exchanges on the Mystery Bag. Customer may buy unlimited bags only while supplies last. Please note: There is no guarantee of said "bonus surprise goodies" with your purchase. Although there aren't any major holidays coming up soon, there seem to be a fairly good amount of sales going on. Why not take advantage of a few? DSW: $10 off $69, $25 off $139 or $40 off $199 with code "SPRINGFUN". KOHL'S: 30% off when using Kohl's card and code "SAVE30". 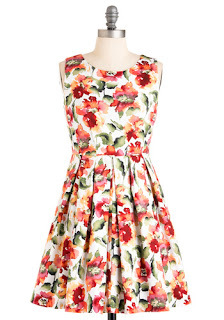 MACY'S: Take an extra 25% off the Friends & Family Sale with code "RETAILMENOT". FASHION IN THE FOREST: Use code "SAVE15" to get a 15% discount on your entire purchase. Check out the "On Sale" section for even more great deals! OLD NAVY: Use code "ONSAVE20" to get a 20% discount. You also get Free Shipping with you spend $50 or more. PACSUN: Take $10 off a $100 purchase with code "DROPDOWN10". VICTORIA'S SECRET: Get Free Shipping on any swim purchase with code "CUTESUIT" or $15 off a $100 purchase with code "SPRING12". I ♥ The Marika Slimming Capri! I recently had the opportunity to review the Marika Slimming Capri. I was kind of nervous about them when I pulled them out of the box. They looked like leggings to me. I was worried about them looking like leggings, or being too tight, or worse...highlight 'every bump in the road', if you know what I mean. My concerns were unfounded. I really like these capri pants! They feature a power mesh waistband and side leg panels for compression & comfort. What I found really awesome is that they have a hidden media pocket in the back waistband. They also feature a gusset lining to wick away moisture. They're 92% Nylon & 8% Spandex so the material is very comfortable. The style is the #MMK578001 and they retail for $60....but if you use code "MIRACLES", you can get 20% off your order! I've worn mine almost every time I go walking & when I work out. They're SO comfortable and I don't feel self conscious at all! Do yourself a favor and get the Marika Slimming Capri today! Sunsational Summer is coming soon! 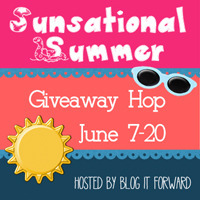 The event is a giveaway hop which will run from June 7th to the 20th and feature 150 bloggers giving away prize packs worth $25 or more each! Head over to Making Time For Mommy if you want to join in on the fun! Hope to see you there! Check out the new "ON SALE" section of my Etsy shop for great deals on your favorite items... There is a great selection - a lot of items are up to 50% off! Check it out today! 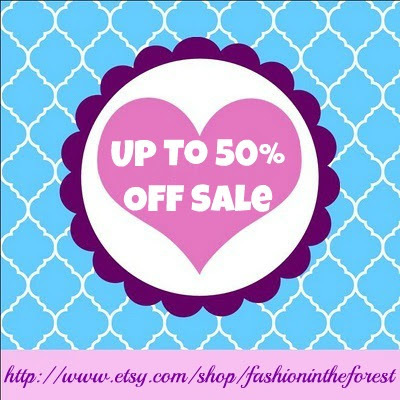 SALE @ Fashion In The Forest on Etsy! There are loads of new items in the Fashion In The Forest Etsy Shop! Check them out today and get a 15% discount on your order with code "SAVE15"! Have a wonderful weekend! Don't forget to check the "On Sale" section for great discounted items! Don't forget, the Avoiding April Showers Giveaway Hop starts on Monday! Check back this weekend to see what great prizes you could win! Are you stalking me via CurrentlyObsessed? If you like my style, then you definitely should! I've got a site on CurrentlyObsessed.Me where I post pictures and links to all my favorites in fashion and home decor. What are YOU crushing on today? I love Kushyfoot products. I really do. I've got the Kushyfoot Ballet Flats To Go and I love them. Actually, I keep them in my purse at all times just in case I need them, they're that great. Over the past few years the Kushyfoot Company has expanded by leaps and bounds. They now carry trousers, knee highs, foot covers, toe covers, athletic socks, tights, foot & toe cushions and cute little flats! Their line of flats massage the wearers' feet with every step; relieving weary aching feet while alleviating stress and tension. Recently, Kushyfoot debuted a collection of new products for Spring/Summer 2012. The new line consists of sole massaging packable flats in open toe and sandal silhouettes plus foot covers galore! The new Kushyfoot Spring/Summer 2012 additions are the Peep Toe (#3631, in Cream or Slate) and Sandals (#3632, in Black). These new styles from the Flats To GO Collection still have the same super comfortable three-dimensional massaging stole for relief from high heels. 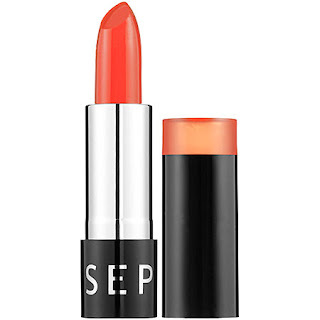 They're lightweight and portable, meaning they're perfect to store in a drawer, purse or car. The big change from the traditional styles is that these are now in an open toe Peep Toe or open toe, side and back Sandals. Sizes run 5/6, 7/8 and 9/10 and are a steal at $9.99 per pair, packed in a cute mini-purse style package. Order online through Kushyfoot and get 20% off and FREE standard ground shipping on all orders over $35. *This review was made possible by the great people at Lipton Publicity & Kushyfoot. I received the black open toe flats in 7/8 for review in exchange for an honest review. No money exchanged hands and these opinions are my own. Thank you Lipton Publicity & Kushyfoot! You've got to see the new FRAAS Spring/Summer Animal Print Scarf. Unless you live under a rock, you'll know that animal print is a huge trend, and has been for a while. It creates a bold statement and can be worn as an outfit with minimal accessories or as complimentary accessories to an outfit. FRAAS recognized the trend and created their own spin on the animal print craze. Pairing the escalating interest in scarves and wraps with the long standing animal print trend, FRAAS is right on point. The scarves are very versatile. They can be worn to accessorize most any type of outfit. If you're a girl into fashion, it won't be hard for you to find a way to incorporate this scarf into your wardrobe. It's made of a lightweight material so it can be worn during the Spring/Summer season as well as Fall/Winter. The scarf clocks in at 28 x 80 inches so it could also be worn as a wrap or sarong swimsuit cover-up! It's perfect for traveling as it takes up very little space and is completely wrinkle free! The Spring/Summer 2012 Collection of scarves features flattering mid tone and neutral shades. 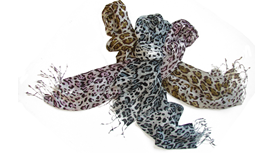 The leopard print scarf (style #393085) comes in three color palettes - pink, green and brown. They retail for $40. *This review was made possible by Lipton Publicity. I received the pink animal print scarf for review in exchange for an honest review. No money exchanged hands and all opinions are my own. Thank you FRAAS & Lipton Publicity. Hush Puppies Spring Break Collection + Discount Code! I'd like to show off my new slippers, if that's okay? They're the new Hush Puppies slippers by Grandoe, which is part of the Hush Puppies Spring Break Collection for Spring/Summer 2012. The Spring Break Collection is all about plush, plaids & prints. The link consists of casual and unique slipper styles and is very appealing to both men and women. These are perfect for lounging around the house, at the pool or beach, or even walking your dog. The featherweight outsole is lightweight, which I like because I don't like to hear my flip flops clomp on the ground - but they're durable as well. I've worn them like crazy and there are no scuffs to be seen. The 'Willow' and 'Ginger' styles are the most popular styles from this collection as they're both made of extremely comfortable micro terry cloth that feels so good on your feet. The 'Willow' is a flip flop which comes in either lavender or red/taupe with a solid foot bed and plaid straps. The 'Ginger' is a clog which comes in white or black with plaid trim. They retail at department and specialty stores for between $40-$42. The Spring Break Collection runs in women's size 6-10 and men's 9-13. These would make a great Mother's Day gift! As a special promotion to the FITF readers, Grandoe has offered a 15% off coupon that is good until May 31st, 2012. Just use promo code "15HUSH" to get this great discount. You can't go wrong with Grandoe. I posted about their fantastic gloves last year. They've been in business for over 100 years; first, making leather gloves and then expanding into footwear. They are a leader in producing innovative and high quality products designed with comfort in mind. Grandoe operates under many brands, such as: Hush Puppies, Cire by Grandoe, Stick It Gloves & Accessories and Smartdogs. If you enjoyed this post, please consider leaving a comment below and using the share buttons to the left of the post. Also be sure to subscribe to my RSS Feed to have future articles delivered to your feed reader or inbox. *This review was made possible by the amazing people at Lipton Publicity! I received the lavender 'willow' flip flop to review in exchange for an honest post. Thank you Lipton Publicity, Grandoe & Hush Puppies! Lucky Clover Giveaway Hop Winner!